Today I have the pleasure of speaking to writer Tom Taylor and artist James Brouwer, creators of my favourite book of recent time, The Deep: Here be Dragons. 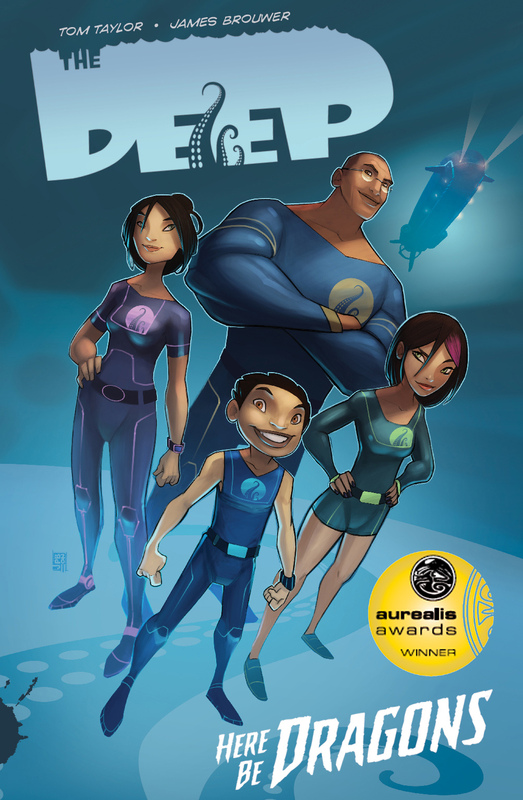 In case you haven't heard, The Deep: Here be Dragons is the Aurealis award winning graphic novel from Aussie duo, Tom Taylor and James Brouwer, and the patriotic streak doesn't end there. This book is beautifully presented by the good folks at the independent Aussie comics company, Gestalt. Follow on after the jump and not only will you get an interview with some of Australia's best and brightest but you will get a look at some interior art and an EXCLUSIVE look at an all new piece of art from the forthcoming VOLUME 2, The Vanishing Island. Intriguing? Ryan: In my recent review, I likened The Deep to a cross between Ben 10 and Seaquest DSV and of course its Vernian nature is obvious. So where did the actual inspiration come from? Tom: The sea and its secrets have always held a large appeal for me. The human race needs mysteries. We need the unexplainable and the unknown. I love knowing that there IS more out there, things that no human being has yet seen or experienced. Things that we can’t immediately explain and, as we become more connected by technology, aren’t a convenient button press away. There’s no better symbol of this for me than the colossal squid. Here we have one of the largest creatures in the world, and we’ve never seen it in its natural habitat. We’ve never interacted with it at all. We’re living right next to this giant myth and, with all our modern marvels, this leviathan has managed to keep its secrets and elude us. This is why I chose the tentacle for the Nekton family logo… also, it looks good. 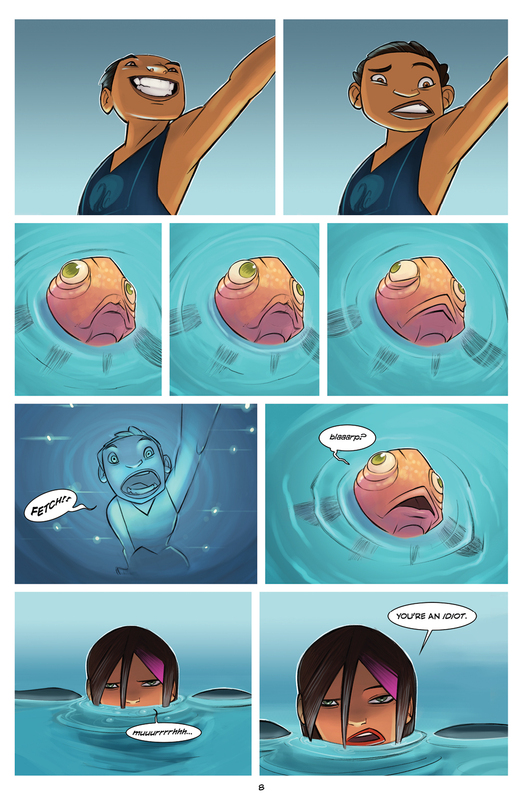 How did the two of you come together to make The Deep? Tom: It was just chance that I came across James’ blog at exactly the right time for both of us. James’ work is simply stunning and I could see him working very well with The Deep. I couldn’t imagine how well. I guess it was just fate that it worked out at the right time for him. The Deep would be very little without him. His art makes me very happy. His art is like watching unicorns prancing in a sun-drenched, daisy-filled field with your face full of chocolate ice-cream and sprinkles. James and I both have young children and we both wanted to create something great for them. It’s worked out well. Our kids are fans. This makes us happy. James: Tom cyberstalked me and promised me fame and fortune. 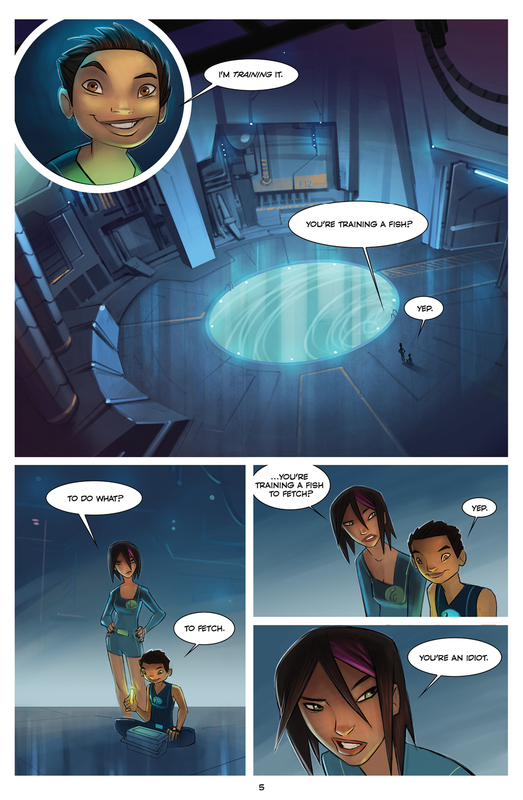 J: But seriously – as an artist you often have people say to you “OOOOO you should illustrate one of my stories!!!”. Tom just happened to be the first person to have a story to illustrate. I read the script and could see straight away its worth as good, fun entertainment, plus its potential as a comic AND a TV show AND a toy line. I think that’s a pretty good sign. When are we going to see more? Here be Dragons was just a taste and left me, and many others, wanting more! J: Either around SDCC (San Diego Comic Con) or the Apocalypse. One or the other, I forget which one. 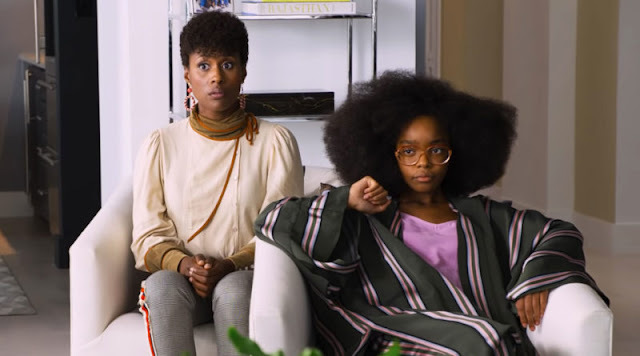 It is fantastic to see a mixed race family in comics, especially when it isn't used as a gimmick or political statement. How did this decision come about and why? T: I do a lot of work in US comics. I write a lot of Star Wars series for Dark Horse comics and Lucasfilm and I also work for DC Comics and others. I love so much about mainstream US comics but I am, and have always been, concerned about their lack of diversity. I think everyone needs heroes and everyone deserves to see themselves in their heroes. With The Deep, I wanted to show that not every family of heroes has to look like The Incredibles. 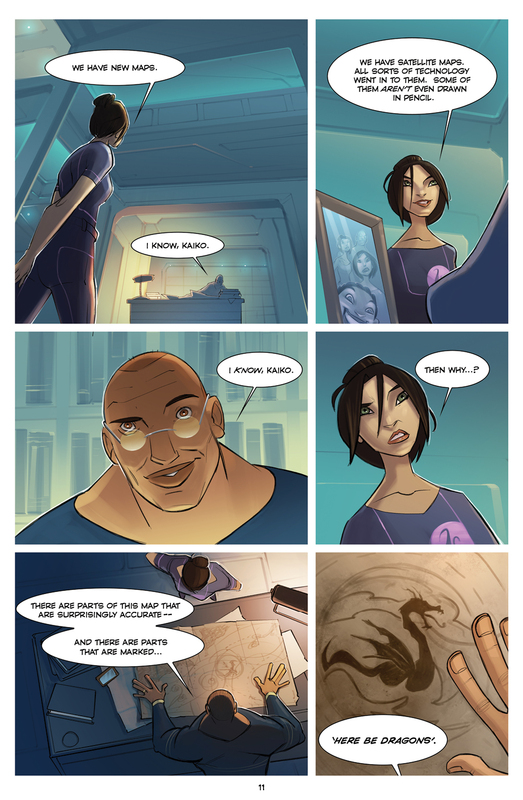 Is the Nekton family named after the series of deep sea dives in Guam called Project Nekton? How much research was done into the life aquatic? T: Nope. Nekton is the name given to all animals who move or swim freely in the ocean regardless of currents. 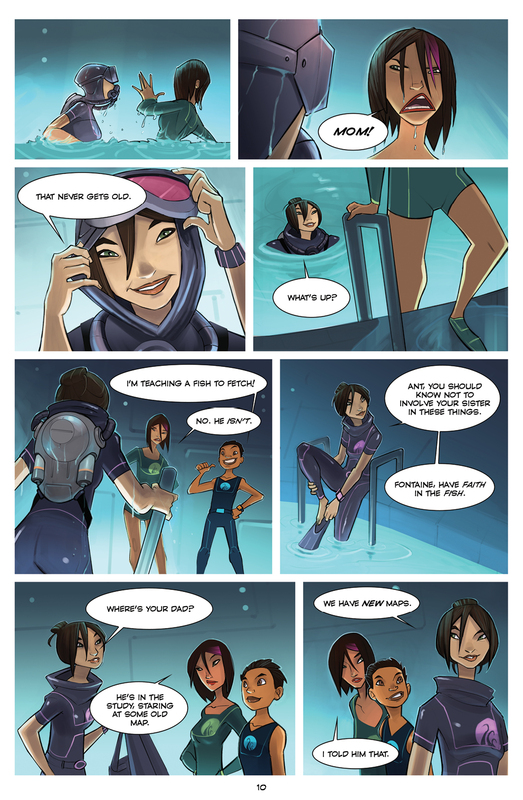 I thought it was a very apt name for our family of Aquanauts. As far as the amount of research, yes, there has been piles. Luckily, I love doing this kind of research when I take on a new project. I love spending days reading about currents and how submarines work, or about how the Roman Empire brought down the walls of Jerusalem, or about the day-to-day life of a wookiee. Geez, I thought I was flexing my brain muscle (thanks for nothing, Wikipedia). The Australian independent comic scene has gone through ebbs and flows for decades, do you see the international success of Gestalt as a sign of things to come? T: I don’t think the Australian comics scene has ever been as strong as it is today. What is now being produced here, while obviously on a smaller scale, is as good as anything being done in the US and elsewhere. The internet has meant that no matter where you are in the world, you can get your work seen. You don’t have to stand in a convention hall with your black-and-white photocopied work and hope that someone will spend a dollar on it anymore. You can tweet, share, blog, and, if it’s good enough, it will spread for thousands to see. This sort of accessibility has really driven the talent coming out of this country. People like Templesmith, Colin Wilson, Nicola Scott and Ashley Wood headed out and conquered US comics. Now, there’s a bunch of people trying to conquer the US and the rest of the world from home, great talents like Tristan Jones, Christian Read, Andrew Constant, Paul Bedford, Jason Franks, Emily Smith, Ben Hutchings, Sacha Bryning, Paul Mason, etc. The list of talent is always growing and now there are publishers who are pouring love and care and attention into the production of their comics. Gestalt Publishing are doing incredible things on a global scale, and then you have others, like Black House and Milk Shadow who have also raised the bar. It all has me very optimistic for the future of comics in Australia. How can budding writers and artists get their work seen? Do you have any tips? T: There’s this thing called the internet, and I think it’s going to be huge. Honestly, just get it out there. Make sure it’s good. Get friends to read or appraise it honestly, and then if they think it’s good enough, put it out there for all to see. We no longer live in a world where you have to post your work to just the right person in some office building in the states. You don’t have to stand in a convention hall charging a dollar for a black-and-white photocopied comic stapled together. If your work is fantastic, and accessible online, it will be seen and develop a fan base. Tweet, share, blog, tumble! The power has shifted. J: Absolutely agree with Tom there: maintaining an internet presence is easy – whether by Blogger, Tumblr, Facebook, whatever – and absolutely crucial for exposure. T: Yes. It easy to maintain an internet presence… so join twitter, James! I’m @TomTaylorMade. Join us. One. Of. Us. One. Of. Us. 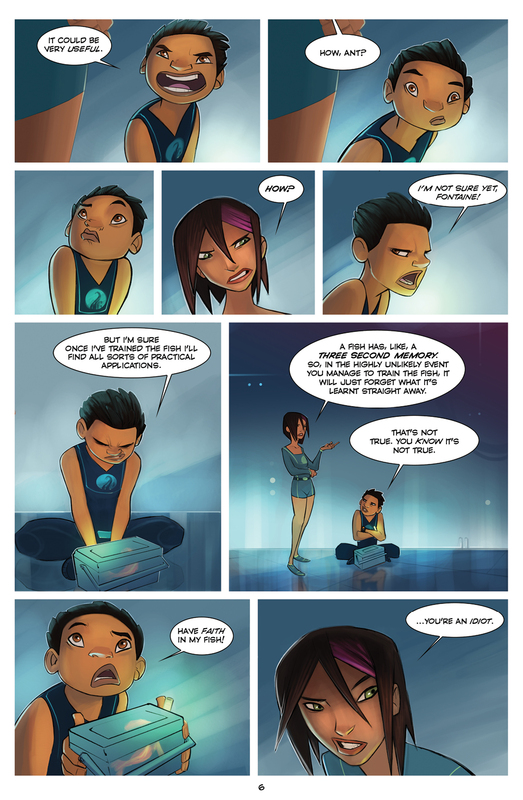 T: On top of The Deep, I’m writing a pile of other creator-owned things for Gestalt that I can’t speak of yet. I’ve just finished writing Star Wars: Blood Ties - Boba Fett is Dead for Dark Horse Comics, and I’m currently writing the return of Darth Maul in Star Wars: Darth Maul - Death Sentence. I’ve written Rose and Thorn for DC comics which should be out in August or September and, last but oh so awesome, I’ve done a small Batman story illustrated by my friend (and fellow Australian) Nicola Scott. I’m also developing a small trans-dimensional doorway designed to get me from my study to my car without the hassle of the stairs in-between. Some might think developing technology that could tap into other worlds and cultures just to use it to get from one room to my car is frivolous. Some might think that we’d be better off using this incredible doorway to learn about incredibly advanced societies on other worlds and, in turn, learn more about ourselves. But to these people I say; ‘there are, like, fourteen steps outside my front door, and sometimes it’s cold’. T: That’s just lazy, James. Lazy. You’re supposed to be my collaborator. Trans-dimensional doorways don’t build themselves! EXCLUSIVE image from volume 2! Intriguing! Thanks for taking the time to speak with me. 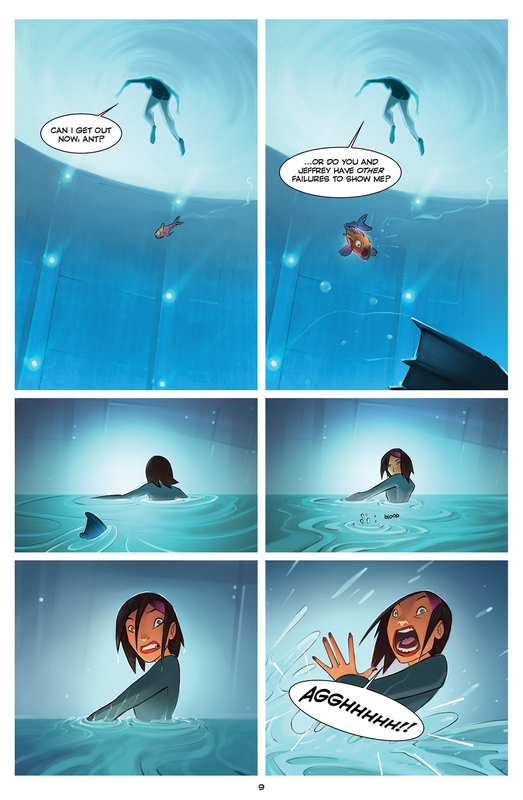 I can't wait to read the further adventures of the family Nekton. T: Thank you! I can’t wait to write them. J: Cheers! I can’t wait to see how many more goofy faces I can draw on Ant. Another big thank you goes out to Mr Taylor and Mr Brouwer for taking the time to have a chat to us here at Geek of Oz. If you take anything from this interview, I implore you to pick up a copy of The Deep: Here be Dragons. I guarantee that you won't be disappointed! Guarantee is no a guarantee at all, just a turn of phrase... you'll get no money from me. 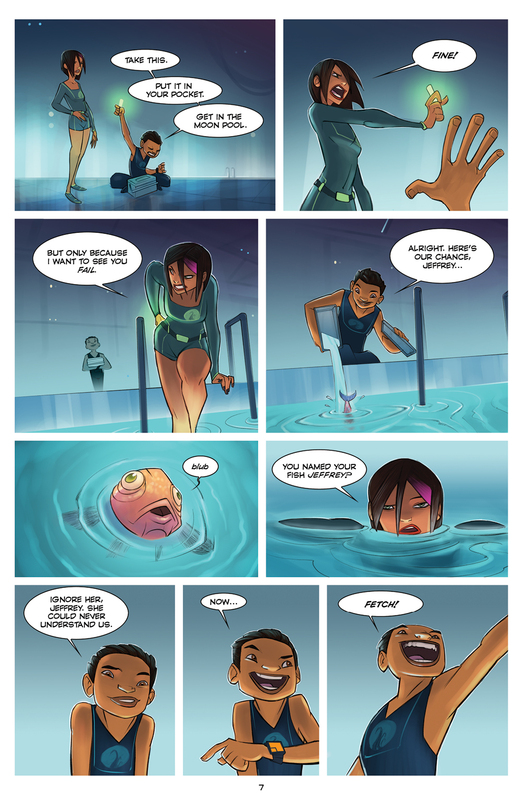 The Deep: Here be Dragons is available now from local distributor, Madman, and good comic stores. Personally, I can't wait until issue ten or twenty when the characters and plots will really have moved on and I can start again with the first issue...love your work guys!